Our ICT School is located in our office premises and it’s well equipped and spacious to accommodate more than 20 students at a time. With the normal public power grid subsidized by our heavy duty generators and high capacity UPS, the lack of electricity is never an excuse to cancel any of our classes. We offer classes from certificate to diploma level in all the Microsoft office packages which can make the youth feel free and confident in a normal Sierra Leonean working environment. We also have the external contacts to organize Microsoft Certified Application Specialist exams in those essential office packages. What makes us unique among others is the low fees we request for our training packages, the modern technology we use to deliver our lectures and the comfortable environment in which we accommodate our students. We also offer it cost free for our affiliated youth groups in and around Kenema municipality. Our digital photo and desktop printing services are intended to provide jobs and income for the underprivileged youth in Kenema. 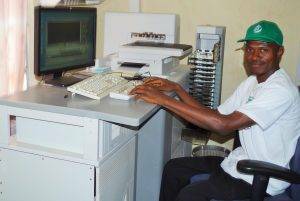 Operated by well trained and experienced youth in desktop publishing and digital photography, our all-in-one commercial printer can copy every coloured document in diverse formats, and the Noritsu 3501 Plus minilab can print up to 1000 4×6 size photos per hour thereby revolutionizing digital photography in Kenema district. While exposing young vocational graduates to diverse desktop publishing technics, we also provide effective training for the needy youth in digital photography and provide them with professional digital cameras on revolving loan contracts which enables them pay back within a limited period of time. The same start-capital is used to purchase more cameras for the benefit of more youth in future. While we print for them at cost recovery, we urge them to pursue future carriers in other fields. This is another innovative way of helping the underprivileged youth to help themselves in our community. It’s more honorable and safer than Okada riding and it enables those who are determined to study further to pay their own fees without bothering parents and extended families. Our event and party management service raises fund for the organization, employ those attached to it and makes us happy and strong to resist the harsh economic environment we are living in. Powered by a mobile generator, our PA system is yet to be beaten by any other public entertainment gadget in the entire Kenema district. 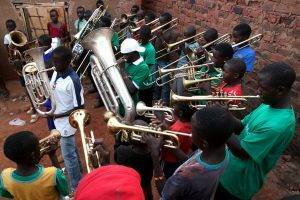 In addition to that, we are currently building up one of the best brass-bands in the country. All the instruments were imported from Europe. We also have dozens of VIP party chairs to let.